Her marvelous watercolors are a joyous expression of the indelible mark nature continues to forge on her soul. The alert colors and intricate flowing lines generate a complexity that never dissolves under the weight of intertwining and multiplying designs. There is an undisturbed enchantment within that beckons the viewer to linger and dream. You could be gazing into a magical stream or a euphoric sky. Turn the paintings in any direction and they continue to speak. Bessesdotter is a Bucks County born painter and art quilter. 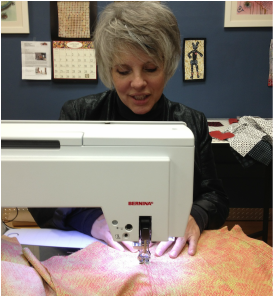 As a Pennsylvania native her affinity for quilting comes naturally. She has a deep regard for the traditional form even as she pushes into new and innovative realms. The marriage between painting, printmaking, design and quilting lends itself to Bessesdotter interpreting herself in a colorful and extraordinarily detailed and imaginative style to create resplendent artifacts. Alison Bessesdotter grew up along the banks of the Delaware River in Pennsylvania in a family of artists and musicians. Currently, Bessesdotter is an ArtsQuest Resident Artist at the Banana Factory in studio in Bethlehem, Pennsylvania. Alison has been by turns a beekeeper, an award winning pie maker, an equestrienne, a painter, printmaker, and flower farmer to name some of her complex and unusual pursuits. An aficionado of the doberman, pit bull, rough coat collie and the toy pug, Bessesdotter is rarely seen without a dog by her side. The artists’ respect for the traditional with an iconoclastic streak and leads her to hang her work in galleries and non-traditional spaces. Her style has been described as improvisational: worlds of magic, euphoria and enchantment. Alison’s paintings, prints and quilts are currently in private and corporate collections.